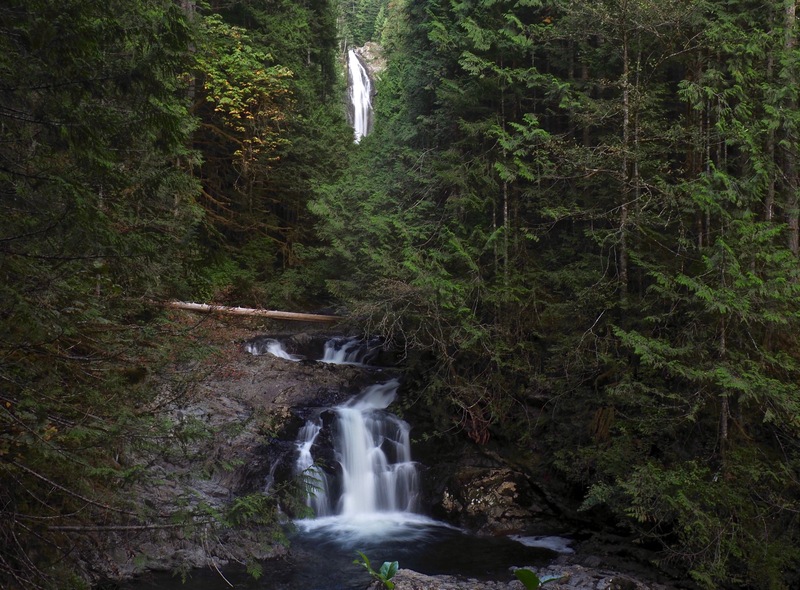 Middle Wallace Falls is the highlight of Wallace Falls State Park’s network of hiking and biking trails. Woody Trail, Wallace Falls State Park, September 11, 2016. Interconnecting hiking and biking trails crisscross Wallace Falls State Park, which, given their low elevation, are hikeable year round. The highlight of the park is its series of magnificent waterfalls along the Wallace River, collectively grouped as the Lower, Middle, and Upper Wallace Falls, although the most prominent, Middle Wallace Falls — visible from five miles/eight kilometers away — are those often simply referenced as “Wallace Falls.” Except for the overlooks along the falls and the open “beach” at the north end of Wallace Lake, the trails are completely ensconced in dense, moss-laden forest. In mid-winter, the low-arcing sun seems ever rising or setting and never quite breaches the shadowy mountain forests and folds that hedge the trails. However, the falls are at their picturesque peak in winter and spring when abundant rainfall and snowmelt swell the plunging Wallace River. Although all the park’s trails provide varied access to Wallace Falls and Wallace Lake, the two hiking-only trails provide the most direct access to each: the Woody Trail to the top of the falls (with a round-trip distance of 5.60 miles/9.00 km) and the Greg Ball Trail to the lake (with a round-trip distance of 9.20 miles/14.80 km to the far end of the lake). Joined by a section of gravel road open to both hikers and bikers, the Woody and Greg Ball trails can also be hiked as a 10.00-mile/16.10-km loop that encompasses both the falls and lake (including the side trail to the far end of the lake, where the view is the best). The trails are named in honor of men who supported trail construction and maintenance: Senator Frank Woody and Greg Ball. The trail begins in an open swath slashed through the lowland forest to make way for heavy spans of power lines conveying electricity from the distant Columbia River. Marring the vista as they do, this dramatic view of Mounts Baring, Philadelphia, Index, and Persis (from left to right) would not exist but for the power lines’ demand for space. Wallace Falls State Park, February 15, 2015. The trail shortly enters forest and is greeted by the Wallace River’s sheeted rush. At 0.40 miles/0.64 km, the trail reaches its first junction. The right fork is the beginning of the Woody Trail that continues upstream. The left fork is the Old Railroad Grade, a remnant of the railroad built to remove the original forest that was felled in the early 1900s and now a gravel path open to both hikers and bikers. Maps posted throughout the park assist in navigating its web of trails and roads. Wallace Falls State Park, February 15, 2015. Mossy arms gesturing into the airy woodlands are a common feature about both the Woody and Greg Ball trails. Greg Ball Trail, Wallace Falls State Park, September 11, 2016. Not to be outdone by its larger riverfellows, a small stream just a half mile/0.80 km from the trailhead cheerily tumbles down Small Falls in its hurry to join the Wallace River. Beyond Small Falls, posted signs along a half-mile/0.80-km interpretive loop trail highlight the indigenous Skykomish people’s connection to the land around the park. The loop trail also leads to a fire pit and semi-circle of benches called the Small Falls Amphitheater. Woody Trail, Wallace Falls State Park, April 02, 2017. At approximately 1.50 miles/2.40 km from the trailhead, the North Fork Wallace River joins the Wallace River’s main fork. Above the rivers’ junction, a connecting trail branches left from the Woody Trail to the Old Railroad Grade again and, shortly, to the Greg Ball Trail, which generally follows the North Fork Wallace River to Wallace Lake. The Woody Trail crosses a bridge over the north fork and continues to the falls along the main fork of the Wallace River. Woody Trail, Wallace Falls State Park, September 11, 2016. Pleasant mixed forest, including moss-laden vine maples (Acer circinatum), drapes the lower reaches of the Woody Trail, transitioning to mostly conifer forests around the falls. Woody Trail, Wallace Falls State Park, September 11, 2016. In addition to spectacular views of the falls, the Woody Trail also offers westward glimpses of the Skykomish River Valley. From the Middle Wallace Falls overlook, the gaze sweeps down the valley and out to the Olympic Mountains beyond. The valley is the historic home of the Native American Skykomish people. “Wallace” is the over-Anglicized version of “Kwayaylsh,” the surname of a Skykomish couple who remained and “homesteaded” in the valley after their rights thereto were ceded to the U.S. government by treaty. Woody Trail, Wallace Falls State Park, February 15, 2015. During the spring runoff, Lower Wallace Falls scours its rocky ledges. Later in the year, its frothy rivulets scatter before regathering out of sight. Woody Trail, Wallace Falls State Park, September 11, 2016. Above Lower Wallace Falls, the parted forest provides a keyhole view of the Middle Wallace Falls beyond. Woody Trail, Wallace Falls State Park, September 11, 2016. At Middle Wallace Falls, the Wallace River plunges 265 feet/81 meters into a verdant, amphitheater-style basin before zigzagging down the remainder of the middle falls. Always majestic, its volume varies significantly throughout the seasons, from spring’s swollen torrent to autumn’s gossamer strand. Woody Trail, Wallace Falls State Park, April 02, 2017. At Upper Wallace Falls, the Wallace River disappears below the trail as it begins its rapid, 800-foot/244-meter combined descent over the three sets of falls. Woody Trail, Wallace Falls State Park, April 02, 2017. From Upper Wallace Falls, a short trail connects the Woody Trail to a gravel road that leads to Wallace Lake. The trail climbs steeply through overgrown forest so littered with woodland detritus that it can be difficult to discern. Blue plastic diamonds nailed to the trees mark the way. Wallace Falls State Park, April 02, 2017. A timber-lined gravel road, called the Upper Grade, extends 1.70 miles/2.70 km from the top of the Woody Trail to the next signed trail junction and then a further half mile/0.80 km rightward to Wallace Lake. Upper Grade, April 02, 2017. Between Upper Wallace Falls and Wallace Lake, the Upper Grade leaves Wallace Falls State Park and crosses land owned by the Department of Natural Resources, where clear-cut logging scars its wayside, but opens views to the Skykomish River Valley beyond. Upper Grade, April 02, 2017. The forest throughout Wallace Falls State Park is still recovering from logging in the early 1900s (long before it was a park). Its progression is especially evident along the Greg Ball Trail, where, at lower elevations, the maturing woodland supports life at all levels, including an understory of sword ferns (Polystichum munitum) carpeting the floor knee-high and a middlestory of vine maples (Acer circinatum) arching through the slender columns that loft a canopy of boughs far above. Greg Ball Trail, Wallace Falls State Park, September 11, 2016. As the Greg Ball Trail climbs, the surrounding woodland’s closely woven canopy blocks most sunlight, resulting in an almost barren floor strewn with branches and logs from the rapid die-off that occurs as the burgeoning young forest thins itself in its slow return to a natural, more open, and many-layered state. Greg Ball Trail, Wallace Falls State Park, September 11, 2016. Here and there, the Greg Ball Trail affords peekaboo views of the North Fork Wallace River that, for much of its distance, chatters mostly unseen along its deeply delved course below the trail. Greg Ball Trail, Wallace Falls State Park, April 02, 2017. Connected by short stints on gravel roads, the Greg Ball Trail and the Upper Grade converge at Wallace Lake’s log-jammed outlet to the North Fork Wallace River, where only a peek at the lake is possible. To reach the opposite end of the lake and a more expansive view, follow signage to the half-mile/0.80-km road that skirts its western edge. Wallace Falls State Park, April 02, 2017. At the opposite end of Wallace Lake, the North Fork Wallace River, so boisterous after exiting the lake, lazily enters the lake’s northwestern end as a mere stream. Skip down its stones to reach the gravelly lakeshore known as “Pebble Beach” for a tranquil view of the lake, Zeke’s Hill, and, barely peering over the horizon, Mount Index. Wallace Lake, Wallace Falls State Park, February 15, 2015. Approximately one mile/1.60 km past Pebble Beach, Jay Lake lies little-disturbed beyond the brushy wreath that hems its shores. Wallace Falls State Park, February 15, 2015.